With St. Patrick’s Day just around the corner, we have more excuses to decorate and have fun with our families. While a green shirt is all we might want to put on for some St. Patrick’s spirit, kids love to decorate. And with this being their March break, Ontario kids have more time on their hands than ever! So here are a few very easy DIY ideas that kids can do to decorate their rooms for St. Patrick’s. How can you celebrate St. Patrick’s without some shamrocks on the wall? Buy a few sheets of green construction paper or Bristol board. You can buy different shades of green and some green glitter. 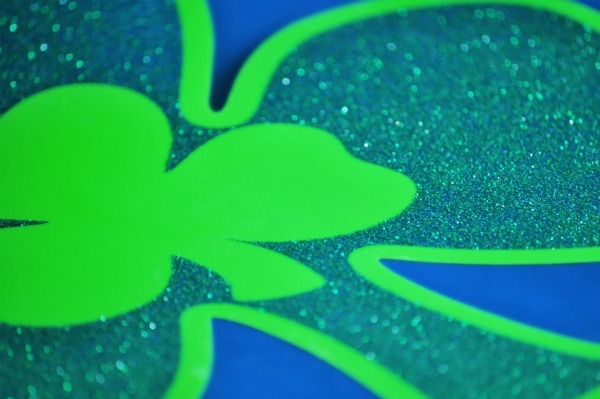 Let your kids trace out some shamrocks and cut them out. Staple 20 to 30 shamrocks side by side and use it as a window decoration or hang it on the wall with balloons on either side. You can write Happy St. Patrick’s Day with a letter on each shamrock. It is easy and safe for kids since no glue guns or cutters are involved, just a pair of kids scissors. If you don’t want to buy green T-shirts or your kids want something a little more celebratory, they can make their own lucky T-shirt. Use any plain white T-shirts (old or cheap ones will do) and some green glitter (glitter nail polish can also do the trick). Have your kids write Lucky plus their names on the shirt (Lucky Sam) with a marker, and then cover the marker with glitter. This can be done in a more sophisticated way, but the point is to have easy and safe DIY activities for your kids to spice up their March break. Rather simply having the kids draw a leprechaun, suggest they put them together by drawing and cutting out bits and pieces for the hat, head, body, arms and legs. They can be glued together, or attached with brads (for moving parts!). You can let the kids get creative with the shoes, hair and faces. They can use black and white construction paper and draw on buckles with glitter pens. They can use yarn for hair and beards. Let them get creative with things they find around the house to customize their leprechaun before they can hang it on their bedroom door.